Perfect for popcorn, nacho chips or peanuts - graphics for all are included. Popcorn, nacho chips or peanuts warmer! Stainless steel warming deck has a heating element underneath to keep all of the product in the cabinet - not just the top - warm and fresh for hours. Easy to clean surfaces - just wipe with a damp cloth. Sturdy stainless steel and aluminum frame and tempered glass side panels. Perfect for popcorn, nacho chips or peanuts - graphics for all are included. Varmebunn som holder popcorn varmt og friskt i lange perioder! Plastic Popcorn Scoop følger med. 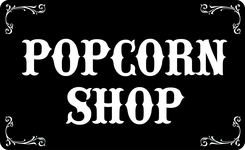 250 stk Popcornbeger 1,4l "Stripe"